Plaridel: A Philippine Journal of Communication, Media and Society was first published in 2004 as a national journal of communication and has been released on a regular bi-annual basis since. It has since evolved to a more inclusive regional focus and has recently begun publishing papers from other Asian countries. 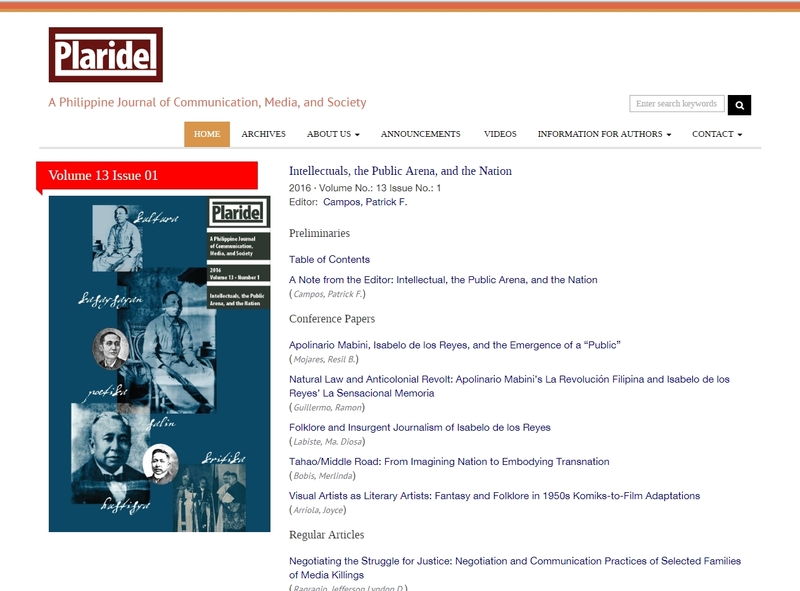 Papers published in Plaridel Journal include original research in different areas of media and communication studies in the Philippines and Asia. These can be qualitative or quantitative work in media effects, industry, political economy, subcultural practices, and journalism studies, among others. Plaridel Journal publishes original articles that have gone through a rigorous double-blind peer-review process. Papers submitted to the journal for publication consideration undergo an initial editorial review by issue and associate editors. At this stage papers can be accepted or rejected. Papers that are favorably reviewed move forward to the blind peer review process. Referees or reviewers are selected based on their publication history and expertise in the field where the article seeks to make a contribution. Plaridel Journal is accorded Category A-2 status by the Commission on Higher Education (CHED) Journal Accreditation System. Plaridel Journal is indexed with the Philippine Journal Citation Index Database (PJCID) as well as with the Emerging Sources Citation Index (ESCI) of Thomson Reuters. Web design and development, content management system (wordpress), custom template design and implementation, search engine optimization and google analytics implementation.